You can still look to mining stocks for significant profits—and something else as well. Resource stocks could play a very important role in your portfolio if inflation begins to creep up again. Our new free report shows how to make the most of mining stocks today. Just click on Best Canadian Mining Stocks TSX: Plus Gold Stocks, Canadian Diamond Mines and More to get your free copy. Mining stocks are cyclical in nature, rising and receding with the demand in the global economy, Lower commodity prices can prompt a number of investors to sell off mining stocks, or avoid them altogether. Our new free report shows why this could be a big mistake. Resource stocks do best when inflation rises. That means mining stocks could serve as your most valuable hedge against inflation if and when it rises again. Our report explains the fundamentals of mining stocks, how to identify higher quality companies, and updates you on the current state of mining in copper, gold, uranium, graphite—and Canadian diamonds. Mining stocks—as well as oil and gas stocks—have a history of rising along with long-term inflationary trends. That means they play a crucial role in your portfolio as a hedge against inflation. Discover even more signs for combating the steady creep of inflation! We recommend that you cut your risk in the volatile resource sector by investing mainly in stocks of profitable, well-established mining companies with high-quality reserves. See how we identify resource stock with higher quality and lower risk. We recommend that you stay out of highly hyped penny mines. If they seem to spend too much time on press releases or marketing their latest partnership, pull out! Learn how to look beneath the surface of penny stock promotions. There is a long lead time from exploration to production with uranium stocks. We look for companies that operate in an area whose geology is similar to that of nearby producing mines. Discover the specific locations where the best uranium mines operate. You’ll discover much more as well, including 6 strategies for owning gold, and why graphite is attracting the attention of junior miners and investors. This exclusive report is yours FREE as my “thank you” for signing up for TSI Wealth Daily. 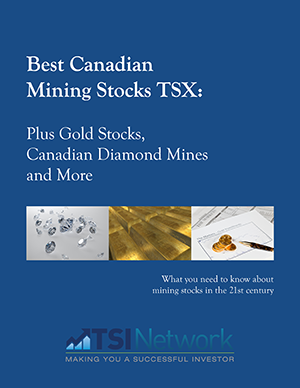 To, you can download Best Canadian Mining Stocks TSX: Plus Gold Stocks, Canadian Diamond Mines and More to get your free copy now. I’d also encourage you to share the report with a friend by forwarding this email to them. For Pat’s advice on how easy it can be to apply the basics of successful investing to your portfolio, download our new free report, How to invest in stocks: Canada investor advice on building a balanced stock portfolio. canadian mining stocks, commodity prices, gas stocks, gold, mining, mining companies, oil and gas stocks, resource stocks, stock portfolio, stocks, tsx, uranium mining stocks, canadian diamond mines, mining stocks, uranium stocks, hedge, How to invest, gold stocks, inflation, fundamentals, Penny Stocks, investing, oil and gas, stocks to invest in, balanced stock portfolio, best canadian mining stocks, commodity, how to invest in stocks, how to invest in stocks canada, investor advice, portfolio, stocks canada, stocks to invest, successful investing, tsi, canadian, wealth daily, junior miners.